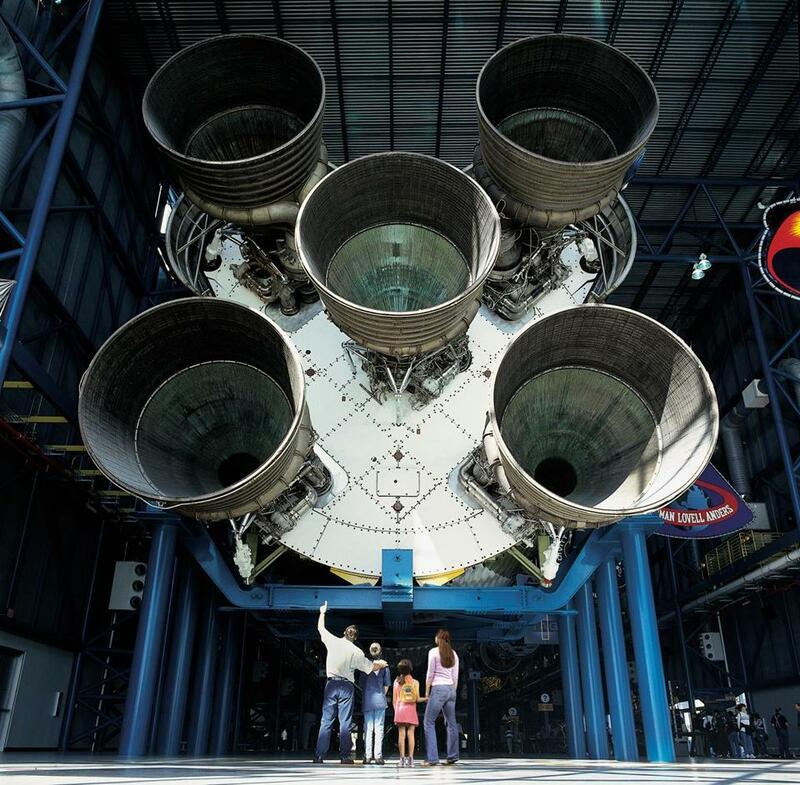 A Saturn V rocket at Kennedy Space Center. Michelle Pelersi calls herself a space nerd. She has better qualifications than most. Pelersi is a program manager in the space systems branch of the Cambridge research-and-development company Draper. But as someone who grew up on “Star Wars” and shuttle missions, she admits to still experiencing a thrill when her work takes her to some of the most iconic landmarks connected with space. “It’s a bonus for me that I get to do that as part of my job,” said Pelersi, who has been noticing a lot of other people showing similar enthusiasm for space by wearing T-shirts with the NASA logo or following the stories of new commercial space companies such as SpaceX. In fact, attendance at terrestrial destinations connected with space is way up. More than 1.5 million people visited the Kennedy Space Center in Florida last year, the most ever and higher than the number who went there in the space shuttle era. A record 8.6 million people crowded into the National Air and Space Museum’s two locations in Washington last year, more than visited any other museum in the world. The Jet Propulsion Laboratory in California has a six-month waiting list for tours. Space Center Houston, home of Mission Control, broke attendance records in the spring. “There is just an inherent fascination with discovery,” said Maria Zuber, vice president for research at MIT, who has herself run various NASA missions and chairs the JPL Advisory Council. This popular enthusiasm for space appears to have been reignited by images of SpaceX rocket boosters landing gently back on earth to be reused and Elon Musk’s Tesla Roadster shot into solar orbit, and by the prospect of space tourism aboard Virgin Galactic or Jeff Bezos’s Blue Origin — engaged in their own new sort of space race — even though both are behind schedule and a seat on either one would cost more than most people could afford. Meanwhile, unmanned explorers are crawling around Mars, the countdown to next summer’s 50th anniversary of the first moon landing has begun, and a backlash against the rejection of science by some politicians and policymakers has led to all those NASA T-shirts and a we-believe-in-science movement. The drive for this is both nostalgic and future-oriented, Protze and others said. Twenty-six percent of guests who come to the famous Florida launch site are interested in its history, a survey found, but 74 percent want to know what’s going on now or coming in the future. “Yes, we have had a big pause in humans going into space on American rockets. But we are getting closer and closer to that happening again,” said Mat Kaplan, host and producer of the Planetary Society’s Planetary Radio. Enthusiasts can also visit the European Space Agency complex, the most popular tourist destination in the South American French territory of French Guiana; it might be a little harder to get to, but the tours are free, while the cost of admission to the Kennedy Space Center rose in July to $57 per adult, plus $10 for parking. It’s even harder to reach Baikonur in Kazakhstan, used by the Soviet Union to launch the first manned rocket in 1961 and the origin of Soyuz liftoffs to the International Space Station. There are (pricey) guided tours to what was once called Star City, however, which often include launches. Closer to home are the Very Large Array radio astronomy observatory, which has a visitor center and gives tours; Virgin’s Spaceport America, where the four-hour tours include the chance to ride a G-force simulator; and White Sands Missile Range, the proving ground for early rockets, where there is a museum. All are in New Mexico. The Palomar Observatory in California, site of one of the world’s largest telescopes, is also open for tours, though only in daylight. But the visitor center at Mauna Kea on the Big Island of Hawaii, home to 13 observatories with nine giant telescopes, has free nighttime stargazing, weather permitting, at an altitude of 9,200 feet; it’s first come, first served, and closes quickly these days because of growing crowds. Lowell Observatory in Arizona, from which Pluto was first seen, also has nighttime viewings. Willing to wait and see the stars up close? Blue Origin says it may take tourists into space next year, seven years past the original goal. Virgin Galactic may launch with passengers late this year, a decade later than first promised; 800 people have already booked seats, at $250,000 each for the 2½-hour trip. Space tourism could become a $1.3 billion-a-year industry as soon as 2021, the consulting firm Futron predicts, and there are plans for a space hotel and asteroid mining. “People get the sense that it’s getting closer,” compelling even greater interest in space, said Erik Seedhouse, who studies commercial space operations at Embry-Riddle Aeronautical University.